A swing with a twist - it's also a bed! We call it a swing bed, and the Amish Yellow Pine Traditional English Swing Bed is one of our most popular outdoor furniture picks here at DutchCrafters. The perfect centerpiece for your outdoor space, this pine outdoor furniture can take center stage on your patio or porch. It can also be set up in your beautiful garden with a solid wood Swing Frame Stand. Enjoy your time in the fresh air with a cozy seat and a smooth swing ride. This solid pine swing is made in the heart of Pennsylvania by our devoted Amish craftsmen who build everything with your comfort in mind. 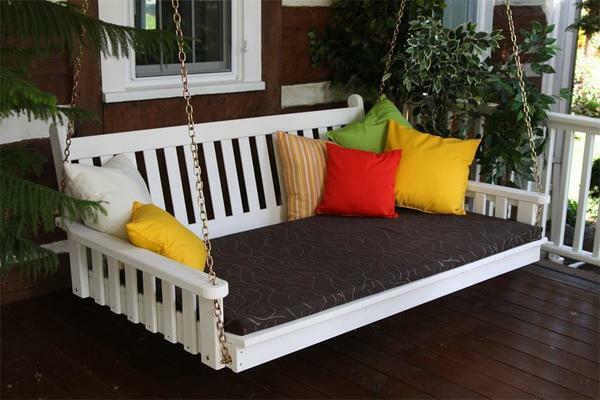 Choose from a variety of paint and stain colors for your swing bed. We are happy to provide samples. Our Sundown Fabrics collection allows you to add your favorite colors to your swing cushions and accent pillows. Sundown Fabrics are covered by a 5 year warranty. Available in three custom made lengths-choose from a 4', 5', or 6' swing. Zinc plated hardware resists rust. Choose either rust resistant chains or consider a rope kit to hang your swing bed. Browse our Amish Garden Furniture Collection for a variety of options for your outdoor furniture collection. If you have any questions about this custom made swing bed, please give one of our Amish Furniture specialists a call at 1-866-272-6773. We're happy to help design your dreamy outdoor space!